Stamp collection is a hobby which is easy to follow. In modern days however it is not easy. 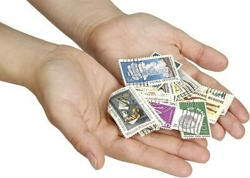 In my childhood days there were snail mails and was quite easy to just rip the stamps from mail and start collecting. Now however it takes some knowledge and effort. Here are some tips for you to start even in the internet age. Stamp collection is real fun and learning as well. Buying a stamp collection starter packet – You can get a wide range of stamps in packet at the local hobby store. There will be hundreds of used stamps and it is a good way to start. Just check that different stamps are stacked in the packet. This method will help kick on with your new hobby. Stamps at Post Office – You can add another facet to your collection by buying crisp new stamps from the local post office. The new “mint condition” stamps are also valuable addition to a collection. I started with ripping off stamps from snail mails but later loved to buy from post office too. Contact offices – Even today office send across postage. They will invariably have stamps. Just visit a few offices and ask them. I am sure you can get a good collection from the offices. They will generally give it to you free of cost. Exchange stamps – You may have same stamps while your friend (email, pen pal or local) might not have that stamp. Exchange it with your friend and add a new stamp to your collection. Use the internet to your advantage.